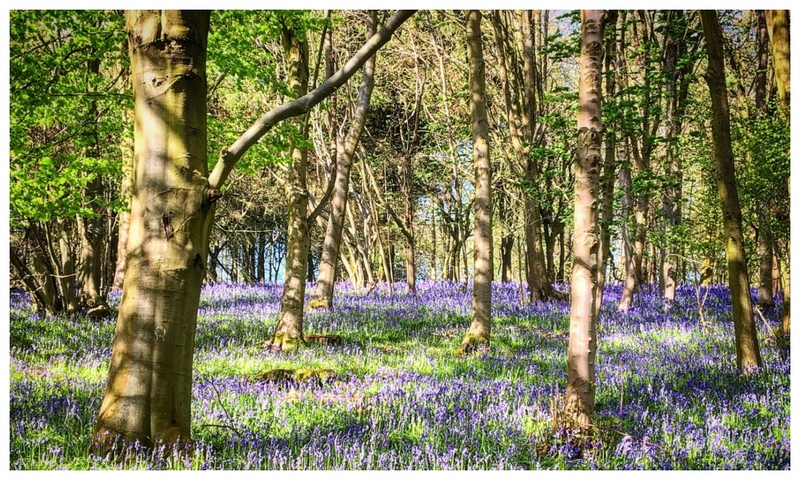 The best places to see bluebells in Leicestershire and Rutland. Blooming 'eck! Bluebells are about to start popping up in their thousands across Leicestershire and Rutland. Here's where to spot the best ones. What’s a sure sign that it’s finally Spring? Finally retiring your thermal vest, yes. But more excitingly it’s the arrival of bluebell season. I’ve drawn up this list as a prompt as these stunning fields of blue are about to start to bloom and will only last a few weeks. So, chop chop! Please do let me know if there are any that I’ve forgotten. Burroughs Wood in Ratby Hinckley is a wood of two halves linked by a public Right of Way. The northern section contains ancient woodland with a sea of bluebells in the spring – definitely worth visiting. A late Victorian property built in 1887, the perfectly formed gardens comprise six acres are approached through a tree lined driveway of mature limes and giant redwoods. The bluebells look beautiful here against the beautiful scenery. Opening times from May 5, 2019 11-5pm. Admission £5 for adults and kids free. Private home but he gardens are lovely and the woodland walk features plenty of bluebells. The main garden comprises a sunken garden, a rose garden, gravel path with herbaceous planting one side and iris and tulip on the other, a vegetable garden, an orchard, and a koi pond situated in a courtyard with white flowering plants and mixed foliage. Open by arrangement only for groups or bespoke visits and they also do a woodland bluebell walk. The garden, framed by mature trees and shrubs, was extensively redesigned by garden designer George Carter in 2007. Now a family garden designed for all generations to enjoy and is surrounded by magnificent views across the countryside and one of the few places to see bluebells this side of Rutland. Open from May 5, admission £4, kids free. This ancient woodland is managed by the Leicestershire and Rutland Wildlife Trust and situated between Launde and Loddington in east Leicestershire and there is a circular walk through and around the wood. There are a variety of ancient trees and bluebells cover the woodland floor as well as other wild plants. Stop off for lunch or tea at Launde Abbey while you’re here. The Outwoods is 110 acres of ancient woodland to the north of Loughborough and is one of the oldest surviving woodland sites in Charnwood. Come at the right time in April/May and you’ll be amazed at the pretty sight of bluebells which carpet the ground. Swithland Wood is part of the Bradgate Estate and is managed by the Bradgate Park Trust. The wood covers an area of 170 acres and is designated a Site of Special Scientific Interest and acknowledged as one of the best remnants of native woodland in Leicestershire and home to its fair share of traditional native bluebells. A combination of two ancient woodlands with an impressive display of bluebells in the spring. This reserve is divided into three parts, Burrow Wood, Cat Hill Wood and the field between them. The display of bluebells here in the spring is a real impressive sight and also attracts a variety of bird life. Two areas not to miss if you’re visiting – the easiest to get to is Barnsdale Woods. The woods can be best accessed by parking at Whitwell car park & following the footpath west towards the woods. Open every day now and is a great walk for your dogs as they can come off their leads here. It is a stunning walk and makes for lots of photo opportunities. Another area, in the middle of the peninsula is Hambleton Woods which is a little less accessible (although this makes it really peaceful) but it does have a cycle route through it. Remember, if you’re walking through the woods, stay on the footpath and don’t walk through the bluebells however tempting this may be. Have I missed any out? Do let me know in the comments below.